And then Dansko came out with a new collection of coated canvas clogs that really answered the call for me. They made 3 different patterns of this clog, and two plain. One in all white, and one that is all black (and shiny!) 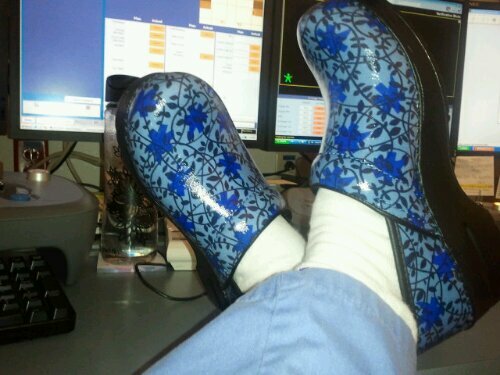 I couldn’t resist picking up this blue pair for work, even if it was still flowery because it matched my scrubs. Their vegan line has a perforated foamy type liner inside in lieu of the leather liner, which is believe it or not, even more comfortable than the originals. These are literally like walking in house slippers with amazing arch support. The fact that they’re coated canvas is a great idea too for durability’s sake. (Not to mention easy to clean up!) That’s what all those incredibly old Louis Vuitton trunks, as well as modern bags are made of, and they last eternally! So what’s the difference between the two brands? My hope is that if they get enough interest, they’ll start making some other styles, like strappy, black sandals before my current ones wear out! Hope this is useful to some of you out there! I have this pattern in pink/black/grey..where did you purchase the blue ones I can’t seem to find them anywhere. It was a while ago, so I’m not sure they’re still in circulation! Where I work a lady took a picture of a pop can on her desk and posted it to facebook. In the background of the picture was her computer screen with confidential information on it. It was a complete accident, but she was fired none-the-less. Hopefully the same thing didn’t happen to you! As a professional, I do take HIPAA very seriously, which is why I made sure that nothing was moded up when I took this picture, as you can plainly see. There isn’t anything on the screens but emptiness.